One PhD position to work in the modelization and the experimental study of novel nano-optoelectromechanical systems (NOEMS) based on 2D-materials (UB, Barcelona, Spain) (April 10th, 2019). One PhD position (Junior Research Fellow) to work in Neuromorphic Nanophotonic Integrated Technologies (International Iberian Nanotechnology Laboratory (INL), Braga-Portugal) (April 10th, 2019). One open position in INTA (Instituto Nacional de Técnica Aerospacial, Spain) to perform image and data collection and related calculations (April 10th, 2019). Open R&D; position at LEITAT Technological Center (Terrassa-BCN, Spain) to be incorporated in the department of additive manufacturing, in the line of applied photonics to SLM technologies (March 13th, 2019). PhD Scholarships between École Normale Supérieure de Lyon (France) and RMIT University (Melbourne, Australia). One in “Coupling of SiC color centers to nanophotonic structures” (March 11th, 2019). Postdoctoral Research Fellow/Senior Research Fellow positions to work on ENIneering MAterial properties with advanced laser direct writing - ENIGMA and Ultrafast laser material processing, Nanostructuring and Geometrical phase optics (Southhampton, UK) (March 11th, 2019). Open PhD position at the "Laboratoire Photonique Numerique et Nanosciences (LP2N)", CNRS, Bordeaux, France (March 11th, 2019). RAL Space, from the Science and Technologies Council (STFC)(UK) is looking for candidates with a background in optical engineering (February 12th, 2019). El Departamento de Ciencias Físicas de la Facultad de Ingeniería y Ciencias de la Universidad de La Frontera (Temuco, Chile) is looking for candidates with a PhD in Physics to work in the field of Applied Optics (February 12th, 2019). 30 PhD opportunities in colour imaging and related fields in the following projects: CHANGE (Cultural Heritage Analysis for New GEnerations) and ApPEARS (Appearance Printing European Advanced Research School) (February 12th, 2019). El Instituto de Óptica del CSIC (Spain) is looking for candidates for 3-years contracts with the profiles attached in the links below (February 12th, 2019). PhD position in microwave photonics available at Bangor University (Wales, UK) (February 12th, 2019). Two postdoctoral research positions for project-collaborations within the Cellex ICFO-The Institute of Photonic Sciences (Spain) – MPQ-Max Planck Institute for Quantum Optics (Germany) Fellowships of 24-months duration (February 12th, 2019). One PhD position open in Universidad Carlos III (Madrid, Spain) to work with nanostructures in third generation solar cells to improve their efficiency (January 24th, 2019). ProCareLight is looking for a technician to work in the field of laser safety (Spain) January 24th, 2019). 4 PhD positions open in QAFM project to develop a quantum limited force sensor for atomic force microscopy. Positions are open in Stockholm, Basel and Vienna (January 24th, 2019). One master's project + 3-year PhD position is available to work at Institut Langevin, ESPCI Paris (France), in collaboration with ONERA, the french aerospace lab (January 24th, 2019). PhD and Post-doctoral positions in the “Nanophotonics Technology Center” at Universitat Politècnica de València, Spain (January 24th, 2019). 15 Early Stage Researcher (ESR) positions are now open in the context of the EU Innovative Training Network project CHANGE (Cultural Heritage Analysis for New GEnerations) . The positions are for three years, competitively salaried, leading towards a PhD degree, and employed at different universities, research institutes, and museums throughout Europe (January 24th, 2019). Mesurex is an engineering company in the technological forefront of Measurement, Automation and Control of processes and applications in the Industrial, Aerospace, Defense, Security, Scientific, Civil Engineering and Geotechnical sectors. The company is looking for an optical engineer (Málaga, Spain) (January 24th, 2019). Two fully funded EPSRC doctoral scholarships are available in the School of Physical Sciences at the University of Kent with a choice of two projects available in the area of Applied Optics/Biophotonics (UK) (January 18th, 2019). Nightvision Lasers Spain (NVLS), a company located in Madrid and leader in the design and manufacture of night vision equipment for military and police users, is looking for an Optical Designer/Engineer. (January 17th, 2019). An international selection tender is open for recruitment of one doctoral position(s) in the project “In vivo biometric and optical changes of the crystalline lens with accommodation and its impact in subjective retina image quality-LensUM” in the Universidade do Minho (Portugal). (January 17th, 2019). Polytechnique Montreal is looking for candidates as a tenure track professor and a Canada Research Chair in Engineering physics (materials and/or photonics and/or biomedical) (Canada) (January 17th, 2019). Two 1-year contracts as Assistant Researcher to work in the field of Structuring of Materials with Ultra-short Laser Pulses are now open at: Instituto de Óptica del CSIC (Madrid, Spain) (January 17th, 2019). A 1-year contract as Assistant Researcher to work in the field of nanostructured materials for photonics applications is now open at: Instituto de Óptica del CSIC (Madrid, Spain) (January 17th, 2019). A 1-year contract as Assistant Researcher to work in the field of image processing and visual models is now open at: Instituto de Óptica del CSIC (Madrid, Spain) (January 17th, 2019). The Laboratorio de Óptica Visual y Biofotónica del Instituto de Óptica del CSIC is looking for a predoc candidate to work in the field of visual optics (Madrid, Spain) (January 17th, 2019). A two-year contract as Assistant Researcher to work in the field of laser processing is now open at: Instituto de Óptica del CSIC (Madrid, Spain) (January 17th, 2019). Two postdoctoral positions in microresonator frequency combs at Chalmers University of Technology (Sweden) (October 30th, 2018). Opened scientist positions (contract) requiring diverse skills in the fields of nanophotonics and nanotechnology including theory & design, nanofabrication and optical characterization at the Agency for Science, Technology and Research (A*STAR) in Singapore (October 30th, 2018). IRIS, a company based in Castelldefels (Spain) is looking for an Optical Engineer to work in different R&D; projects related with industrial solutions in different fields (food, pharma, chemical and materials). (October 30th, 2018). The Photonics Research Labs of ITEAM (Institute of Telecommunications and Multimedia Applications) at the Universitat Politècnica de València (Spain), within the framework of different European and national research programs, offers a position for 1 PhD candidate on the development of new multicore/multimode fiber devices (October 30th, 2018). A PhD position for a Doctoral Thesis is open at the Instituto de Óptica (CSIC) (Madrid, Spain) to work in the project "Ultrafast laser Directed Self-Organization of Nanostructures" (October 30th, 2018). Deneb Medical is a start-up based in San Sebastian (Spain) focused in the development of a novel surgical robot. The company is looking for an Expert in Artificial Intelligence that will lead all the activities in this area. (October 30th, 2018). The Institute for Physical and Information Technologies (ITEFI), Spanish National Research Council (CSIC), is looking for a candidate to apply for a FPU studentship to work in the field of quantum communications (Spain) (October 30th, 2018). Two PhD Studentships funded by Israeli Science Foundation at Electrical and Computer Engineering Department of the BGU (Ben-Gurion university) to perform theoretical analysis and numerical simulations of the informational capacity limits of the fiber-optical telecommunication systems (Israel) (October 30th, 2018). PhD grant available at Nottingham University (UK) in collaboration with Sensofar company (Spain) on "Characterisation of confocal microscopy for surface topography measurement" (October 5th, 2018). A PhD position for a Doctoral Thesis is open at the Escuela de Ingeniería de Bilbao (Universidad del País Vasco) (Spain) to work in the field of infrared termography (October 5th, 2018). ASE Optics Europe, a company based in the city of Barcelona focused on the development of custom optics and integrated optical systems, is looking for a mechanical engineer to complement their technical team (Spain) (October 5th, 2018). The Laboratory of Nano Optics at the Physics Department, Faculty of Science and Technology (University of Siegen, Germany), aims to fill an open position with a graduate research assistance in a fixed term contract, initially for three years (October 1st, 2018). The R&D; group of Snelloptics located at the CD6 Technological Center (Terrassa, Spain), focused on Optical Engineering, offers a job position on the subject of the design of sensors and optical devices for industrial applications. Possibility of doing a PhD on the subject. If interested, please send CV to carles.pizarro@snelloptics.com (September 26th, 2018). A PhD position for a Doctoral Thesis is open at the Instituto de Micro y Nanotecnología (IMN) in Madrid (Spain) under the EU project “Scalable Two-Dimensional Quantum Integrated Photonics (S2QUIP)” (September 24th, 2018). The research group Tecnopto UMH at Universidad Miguel Hernández (Elche, Spain) offers a Postdoctoral position within the project PROMETEO/2017/154 of Generalitat Valenciana “Development of vector and polarimetric optical instrumentation” (September 24th, 2018). PhD studentship for EU citizens to join the Nano-Optics Group (King's College London, UK) and work on nonlinear metasurfaces and vortex beams (September 24th, 2018). Open postdoc positions at the FEMTO-ST Institute, Optics Department (University of Franche-Comte and CNRS) (Besancon, France) to work in the field of ultrafast optics and laser materials processing (September 7th, 2018). An EngD (similar to a PhD, yet in much closer collaboration with industry), is available at University of Dundee (Scotland) to work for an holographic augmented reality project. (UK) (September 6th, 2018). The Institute of Photonics (Physics Department) at the University of Strathclyde seeks applications for a Postdoctoral Research Associate in Semiconductor Laser Networks for Neuro-Inspired Information Processing functionalities (UK) (September 6th, 2018). The Visual Optics Lab Antwerp (VOLANTIS), part of the Antwerp University Hospital (Belgium), is currently looking for a scientific researcher/ PhD student to work in the early detection of keratoconus, a disease that can be treated in its initial stages giving patients a better long-term quality of vision. The project involves working with a machine-learning program that automatically detects unusual corneal shapes measured with the Pentacam corneal tomography system and biomechanics (elasticity) (Belgium) (September 6th, 2018). A fully funded PhD studentship to start in 2019 is available in the School of Computer Science and Electronic Engineering at Bangor University (UK) (September 6th, 2018). Postdoctoral Position in Photonics at the Institute of Materials Science of Barcelona ICMAB (CSIC) to work in the field of the integration of large area and inexpensive photonic architectures in optoelectronic devices (Spain) (July 25th, 2018). ProCareLight is looking for a technician to work in the field of laser safety (Spain) (July 25th, 2018). Deneb Medical, a start-up based in San Sebastian (Spain) is looking for an Expert in Laser Processing that will work in the design, integration, and experimental validation of different optical systems (July 25th, 2018). RAL Space has a vacancy for two experienced Optical Systems Engineers (UK) (July 25th, 2018). Job vacancies in VLC Photonics, a technological spin-off company from the Technical University of Valencia (Spain) (July 25th, 2018). RAL Space Imaging Systems Division is looking for an experienced Cold Atom/Quantum Optics Physicist to contribute in the development and commissioning of the RAL Space Atom Interferometer and its optimisation for space applications (UK) (July 25th, 2018). PhD position in the Department of Physics, Politecnico di Milano (Italy), in the framework of the MSCA ITN project LightDyNAmics (June 29th, 2018). Two opened researcher/postdoc positions at the Institute of Material Research and Engineering (Singapore) for the project related to development of optical dielectric nanoantennas and their applications in nanophotonics and nanotechnology (June 29th, 2018). Research position on printed optics by ultrafast laser direct writing and PhD position on laser modification of materials at micro- and nanoscale for photonics and information technology at University of Southampton (UK)(June 29th, 2018). Brussels Photonics offers one PhD position on second-harmonic imaging of biotissue with optical-fiber-based light collection (Belgium) (June 29th, 2018). PhD researcher position on laser-induced forward transfer printing for micro-assembly of electronic and photonic components at Ghent University (Belgium)(June 27th, 2018). PhD Scholarship in Optical Fibre Sensing at Limerick (Ireland) to work in the clinical field (June 27th, 2018). PhD positions currently open at ORC (UK) to work in the field of Laser modification of materials at micro- and nanoscale for photonics and information technology (June 27th, 2018). Three fully funded PhD positions currently open at IMT-Atlantique, Brest, France: one industrial, the other two funded by an EU project (France) (May 31st, 2018). Research contract at Universidad Complutense de Madrid within the framework of the project PCIN-2017-021: “Generación de tercer armónico en elementos ópticos revestidos con grafeno - nuevos dispositivos para la medida de pulsos ultracortos y para conversión de frecuencia” (Spain) (May 31st, 2018). PhD and postdoctoral openings at CNRS' LPTMS lab in Orsay (Paris area). The postdoc will have the opportunity to work on frustrated self-assembly, theoretical descriptions of the cytoskeleton, protein-membrane interactions and other problems at the interface between Statistical/Soft Matter Physics and Biology (France) (May 31st, 2018). The research group “Femtosecond spectroscopy and ultrafast laser control” of Prof. Thomas Baumert at University of Kassel is looking for a PhD student within Collaborative Research Centre 1319 “Extreme light for sensing and driving molecular chirality (ELCH) (Kassel, Germany) (May 31st, 2018). Postdoc position on eye-tracking at the "Instituto de Ciencias del Patrimonio del CSIC" (Santiago de Compostela, Spain) (May 22th, 2018). Night Vision Lasers Spain, a company dedicated to the design and manufacture of optoelectronics for military and police users is looking for an optical designer/engineer (Madrid, Spain) (May 22th, 2018). Research Associateship (Bolseiro de Investigaciòn) on Photonic structures and Photosynthesis available at INL (Braga, Portugal) (May 22th, 2018). Two PhD positions are open in the framework of a project coordinated by EURECAT and University Rovira i Virgili, Tarragona (Spain) in the field of fabrication and characterization of optical materials (May 22th, 2018). A PhD position is open at the INM in Madrid, Spain, under the EU project “PhotoQuant” with the objective of design and fabricate nanophotonic devices to measure temperature in the classical and quantum regime using light-matter interaction (May 22th, 2018). PhD Position in Ultrafast Laser Material Processing (Marseille, France) (April 9th, 2018). A PhD position is open as a joint project between the C2N (France) and the IMN (Madrid, Spain). This project aims to realize quantum photonic sources based on nonlinear interactions in optical nanocavities with few photons (April 9th, 2018). Postdoctoral contract in optical design to work in the European Solar Telescope Project at the Instituto de Astrofísica de Canarias (Spain) (April 9th, 2018). Postdoc position on specialty optical fibers at the Czech Technical University in Prague (Czech Republic) (April 9th, 2018). Open PhD position to work in the field of spectral imaging at Department of Computer Science of the Norwegian University of Science and Technology (Norway) (April 9th, 2018). Postdoctoral position in eye-retinas imaging at the SLN lab, ICFO (Spain) (April 9th, 2018). Two PhD grants are available at Chalmers University of Technology (Gothenburg, Sweden) to work in silicon photonics and on chip optical spectroscopy (April 9th, 2018). LEITAT, a Spanish Technological Center, is looking for a junior researcher with a background in optics and photonics (Spain) (April 9th, 2018). A PhD position is available at the Institut Fresnel (Marseille, France) to work in the project "3D optical computational microscopy for quantifying T lymphocyte activation" (April 9th, 2018). Prof. Bahram Javidi (University of Connectiut, USA) is looking for graduate students interested in developing a thesis on Multidimensional Optical Sensing and Imaging Systems at the UConn MOSIS group (April 9th, 2018). A PhD position is available at the University of Stuttgart (Germany) to work in the project "Single Molecule Quantum Optics" (April 9th, 2018). A PhD position is available at the University of Stuttgart (Germany) to work in the project "Quantum Storage of Single Photons" (April 9th, 2018). A PhD position is available at the DIPC in San Sebastián (Spain) in the field of quantum phenomena in plasmonic systems (April 9th, 2018). VLC Photonics, a Spanish company working in the field of nanotechnology and photonics, is looking for a lab technician (Spain) (April 9th, 2018). The Integrated Training Network in Dry Eye Disease Drug Development (IT-DED3) is looking for 12 talented and motivated Early Stage Researcher (ESR) - PhD students with the skills, knowledge and enthusiasm to help the network make significant research breakthroughs. One of the ESRs will work in the field of OCT (Optical Coherence Tomography). Interested candidates are invited to submit their application through the application form before March 2, 2018 (February 14th, 2018). The Vision and Eye Research Unit (Anglia Ruskin University, Cambridge, UK) is advertising a fully funded 3 years PhD studentship to work in a project related to the detection of glaucoma using a diverse range of optical techniques (February 14th, 2018). A PhD position is available at the Department of Physics of the University of Strathclyde in Glasgow, Scotland (UK) (February 14th, 2018). Post-doc position available at King's College London, to work on single-photon avalanche diode (SPAD) array detectors for polarization-resolved Fluorescence Lifetime Imaging (FLIM) (UK) (February 14th, 2018). Postdoctoral position available in the Grupo Complutense de Óptica Aplicada, Departamento de Óptica, at the Facultad de Ciencias Físicas de la Universidad Complutense de Madrid (Spain) to work in the project "Desarrollo de un sistema industrial de grabación de redes de difracción/polarización para su aplicación en encóderes con láser de femtosegundo" (February 14th, 2018). A Master Thesis position is available for six months at the Laser Zentrum Hannover (Germany) to work in the field of ovel pump concepts for single-frequency fiber amplifiers for next-generation gravitational-wave detectors (February 14th, 2017). A PhD position is available at the Grupo de Procesado por Láser, Instituto de Óptica (CSIC) (Spain) to work in the field of Nano-y Meta-materials for photonics applications (January 25th, 2017). A PhD position is available at the TecnoptoUMH group of the Universidad Miguel Hernández in Elche (Spain) to work in the field of vectorial and polarimetric optics (January 25th, 2017). Alcyon is looking for a Photonics Chief Technology Officer (CTO), who will be part of a new technological company emerged from the valorization of disruptive photonics technologies developed between the University of Málaga and the Spanish National Research Council (CSIC) (Spain) (January 25th, 2018). Osram (Malaysia) is looking for a candidate for an internship to work in the field of Product/Application Optics Engineering (Simulation & Modeling) (January 25th, 2018). Open call for a young researcher with a profile on "Comunicaciones cuánticas para la comunicación segura global" at Instituto de Tecnologías Físicas y de la Información, CSIC, Madrid (Spain) (January 18th, 2018). Voptica SL, a spin-off company of the University of Murcia (Spain) working in the field of adaptive optics simulators, is looking for candidates to apply for "Industrial doctorates 2017" and "Torres Quevedo 2017" grants (January 18th, 2018). The Laboratorio de Óptica Visual y Biofotónica from the Instituto de Óptica “Daza de Valdés” (CSIC, Madrid, Spain) is looking for a PhD researcher to work in the field of biomedical imaging (January 18th, 2018). 3 PhD positions are available at the Institut Fresnel, Marseille (France) in the field of 3D optical microscopy, infrared tomographic microscopy and bimodal superresolved tomographic - fluorescence microscopy (January 18th, 2018). Fully-funded PhD position (for UK/EU students), covering living costs and tuition fees.The project involves developing a multi-spectral photo-acoustic imaging system in the Applied Optics Group (based at the University of Kent, Canterbury, UK) (January 18th, 2018). AIMEN is looking for a Senior Researcher in Laser Material Microprocessing (Spain) (December 22th, 2017). One year contract is available at the Optics Institute (CSIC), in Madrid (Spain) on "Adquisición de conocimientos teorico-prácticos de procesamiento digital de imágenes, para la compensación de los efectos de las imperfecciones de las cámaras (óptica y sensor)" (December 22th, 2017). Postdoctoral fellowship available from January 2018 for 24 months within a UK- and EU- funded centre exploring nanostructured materials for photonics- and bio-applications in the UK NanoPhotonics Centre (UK) (December 19th, 2017). MESUREX, an engineering company at the technological forefront of measurement, automation and process control in the Industrial, Aerospace, Security and Scientific sectors, is looking for an optical engineer (Spain) (December 19th, 2017). A PhD position is available at the Research Training Group "Metrology for Complex Nanosystems NANOMET", established by the Technische Universität Braunschweig and the Physikalisch-Technische Bundesanstalt (Germany)(December 12th, 2017). Open position (3 years) in the field of UV measurements in Aria e Atmosfera - Radiazione solare e atmosfera ARPA Valle d'Aosta (Italy) (Desember 12th, 2017). Two fully funded optics based PhD projects commencing in September 2018 are available at the University of Exeter, UK (December 12th, 2017). Pro-Lite Technology Iberia, a company dedicated to the distribution and service of photonic equipment, is looking for a Junior Sales Engineer (Barcelona, Spain) (December 12th, 2017). Centro Tecnológico del Plástico de Andalucía Andaltec (Spain) is looking for a Junior Optical Engineer (November 7th, 2017). Deneb Medical, start-up based in San Sebastian (Spain) is looking for an Expert in Optics and Photonics (November 7th, 2017). One collaboration student grant is offered by the "Servei de Gestió de la Innovació" (patent office) of the UPC (Spain) (November 7th, 2017). SECPhO (Southern European Cluster in Photonics and Optics) is looking for a Project Manager (Spain) (November 7th, 2017). Open optical design engineer position in ASE Optics (Barcelona, Spain) with interests in applied optical design in imaging and non-imaging systems (Spain) (October 24th, 2017). Public call of the consortium of ultra-short ultra-intense pulsed laser centre (CLPU) for the hiring of a laser technician (Spain) (October 24th, 2017). Public call of the consortium of ultra-short ultra-intense pulsed laser centre (CLPU) for the hiring of a scientist (Spain) (October 24th, 2017). COGNEX is looking for an optical engineer to work in the ID products group (Germany) (October 11th, 2017). A PhD position is available at University of Zaragoza in the field of laser optical technologies (Spain) (October 11th, 2017). A PhD position is available at University of Bordeaux in the field of characterization of random media with gain - 3D random lasers (France) (October 11th, 2017). A PhD position is available at ICFO in the field of experimental quantum physics ultracold atoms (Spain) (September 18th, 2017). CD6 (UPC) is searching for an experienced PhD/posdoc researcher with experience in prototyping and an specialty in firmware and analog electronics development (Spain) (August 29th, 2017). RAL Space, part of the STFC Rutherford Appleton Laboratory, has a vacancy for an Optical Systems Engineer (UK) (August 29th, 2017). 5G STEP-FWD, a newly launched Marie Skłodowska-Curie Innovative Training Network (ITN) offers fifteen (15) PhD positions in six European countries (August 29th, 2017). FICOSA is looking for an optical engineer to work in the field of automotive lighting (Spain) (July 25th, 2017). IDIADA offers a position to work in the optical laboratory (Spain) (July 25th, 2017). A PhD/Postdoctoral position is available in the laboratory of Dr. J.D. Seelig, in the Max Planck Research Group Neural Circuits (Germany) (July 25th, 2017). The KTH Royal Institute of Technology, School of Engineering Sciences (Stockolm, Sweden), offers one PhD and one postdoc position in the field of Wood Photonics (July 25th, 2017). Photonic Sensors & Algorithms SL offers a position to design state-of-the-art mini cameras with the specific technology and applications the company is developing for its use in portable devices (specially smartphones) (Spain) (July 25th, 2017). One open PhD position in “Mitigation of fiber nonlinear impairments in high symbol-rate high-order QAM” in Orange Labs (France) (July 25th, 2017). One open PhD position in Special Light Sources based on Optical Fiber at the University of Valencia (Spain) (July 25th, 2017). 2 open PhD student and 2 postdoc positions, within the ERC Advanced Grant UMWP-CHIP "Universal microwave photonics programmable processor for seamlessly interfacing wireless and optical ICT systems" (Spain) (June 13th, 2017). The Instituto de Astrofísica de Andalucía del CSIC offers a 1-year position to work in the field of optical design for telescopes and instrumentation for astrophysics (Spain) (June 13th, 2017). ProCareLight offers a position in LASER SAFETY (Spain) (June 13th, 2017). IK4-TEKNIKER offers a researcher position in LASER MATERIALS PROCESSING (Spain) (May 30th, 2017). Spanish company leader in the ophthalmic optics field located in Barcelona looking for a researcher with a Physics or Telecommunication Engineering Degree and a strong background in Optics for the R+D (May 30th, 2017). Photonics Research Labs of the iTEAM Institute are offering a Postdoctoral position to a well-qualified, highly motivated and dynamic scientist/engineer, with a background on optical communications, integration systems and integrated photonics (Spain) (April 26th, 2017). Open PhD position in ASE Optics (Barcelona, Spain) in optical systems computational imaging integration (Spain) (April 26th, 2017). Research summer grants at Laboratorio de Óptica de la Universidad de Murcia (LOUM) (Spain) (April 26th, 2017). Two Funded Postgraduate Scholarships in Biomedical Optics (UK) (April 26th, 2017). 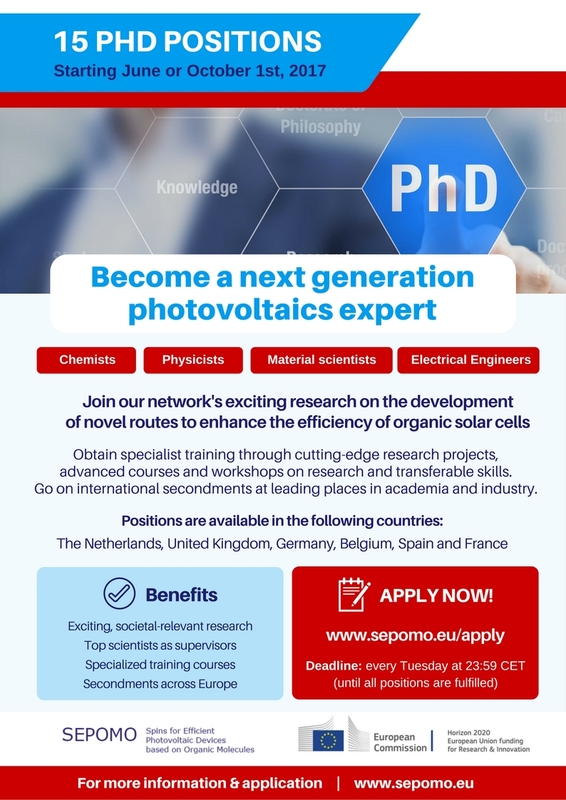 Open PhD PhD grants offered within an ITN (H2020 MSCA Innovative Training Networks (ITN)) related to organic solar cells (April 26th, 2017). Open Laser Engineer/Scientist position in Femtosecond Temporally Coherent Supercontinuum Fiber Laser for Multi-Photon Microscopy (FEMTOCOLORS) in FYLA LASER, S.L. (Spain) (April 26th, 2017). Open PhD position on Multiscale dynamics of laser-induced NP self-organization in composite films (Laboratoire Hubert Curien, Saint-Etienne, France). Open PhD position in quantum cryptography in the University of Vigo (Spain) (March 23rd, 2017). The Spanish National Cancer Research Center, in Madrid (Spain), offers a position to work in confocal microscopy (March 23rd, 2017). Postgraduate Scholarship in Biomedical Optics with emphasis on Optical Coherence Tomography (University of Kent, UK). Open PhD positions in the Grenoble doctoral programmes for Quantum Engineering (France) (March 3rd, 2017). LEITAT technological center (Spain) is looking for a Senior Researcher in Photonics. The International Iberian Nanotechnology Laboratory (INL), in Braga (Portugal) offers a Research Engineer position to work in Probe-based Imaging Diagnostic Tool for In vivo Atherosclerotic Biomarker Detection. The UCL (London's Global University, UK) offers a Research Associate position to work as part of a team carrying out research leading to the development of a multi-sensor digital photogrammetric demonstration system capable of going beyond the current state of the art in terms of accurate on-line measurement over large volumes. The Politecnico di Milano (Italy) offers a PhD position in the context of femtosecond laser nanofabrication. Procarelight (Barcelona, Spain) is looking for a PhD in the field of Photonics. ASE Optics (Barcelona, Spain) is looking for an optical engineer with interests in applied optical design in imaging and non-imaging systems. ASE Optics (Barcelona, Spain) is looking for an experienced computational imaging scientist focused on algorithm enhancement and high speed image processing. The Fresnel Institute (France) offers a PhD position in the context of the use of electromagnetic wave in the microwave domain for probing the subsurface in a nondestructive way: "MIMO sensor for near-subsurface imaging". The ICMAB (Institute of Materials Science Barcelona, Spain) offers a PhD position related to organic solar cell thematic: "Nanoscale morphology and microstructure of organic thin films". The Group of Displays and Photonic Applications of the UC3M offers a position in the Program "Programa Operativo de Empleo Juvenil 2014-2020" (Reference: PEJ16/TIC/TL-1589) (Madrid, Spain) (January 17th, 2017). The Group of Lasers, Nanostructures and Material Processing of the Instituto de Química Física Rocasolano offers a position in the Program "Programa Operativo de Empleo Juvenil 2014-2020" (Reference: PEJ16/IND/TL-1485) (Madrid, Spain) (January 17th, 2017). Pro-Lite Technology Iberia is looking for a Commercial Technician with knowledge in Photonics (January 17th, 2017). The Instituto de Óptica (CSIC, Madrid)) is looking for 3 PhD-FPU candidates(January 17th, 2017). The Instituto de Óptica (CSIC, Madrid)) is looking for PhD-FPU candidates in image processing and optical design (January 17th, 2017). Luz WaveLabs is looking for PhD candidates (January 17th, 2017). One PhD position in experimental optics and photonics: implementation of neuromorphic computing in quantum dot emitter networks, Universitat de les Illes Balears, Palma de Mallorca, Spain (December 20st, 2016). Available PhD positions at the Institute of Photonics and Quantum Sciences at Heriot-Watt University, Edinburgh, UK (December 20st, 2016). Marie Curie Early Stage Researcher/PhD position available at Nicolaus Copernicus University (Poland) (Desember 14th, 2016). MRC Funded Doctoral Training Program at the University of Warwick, UK (November 16th, 2016). Open position as an Optical Engineer in FICOSA, Viladecavalls Spain (November 16th, 2016). Open position in ultra cold atoms in the BEC group in Paris, France (October 25th, 2016). Three PhD studentships in Engineering Photonics at Cranfield University (UK) are available (September 1st, 2016). One PhD position related with the development of superconducting nanowire single-photon detectors for quantum communication at the Group of Applied Physics at the University of Geneva is available (September 1st, 2016). One PhD position related with nanophotonics at the "Photonics and Semiconductor Nanophysics", Technical University of Eindhoven, Netherlands is available (September 1st, 2016). Two PhD positions are available in the group "Nonlinear dynamics, nonlinear optics and Lasers" (DONLL) of the Universitat Politècnica de Catalunya (July 13th, 2016). Via the Innovative Training Network “Solar Energy to Biomass – Optimisation of light energy conversion in plants and microalgae” (www.uni-frankfurt.de/se2b) we offer a challenging Ph.D. position in the Laboratory of Biophysics of Wageningen University. The candidate needs a graduate title in physics or mathematics and a master of 60 ECTS. CV must be sent before June 30th. The candidate needs a graduate title in physics, electronics, materials science or similar with a master level (or equivalent) before September 1st, 2016, when the PhD contract will start. The group of Quantum Interactions with Nanoparticles at Macquarie University (Sydney, Australia), led by Prof. Gabriel Molina-Terriza, has two open positions for bright and highly motivated Ph.D. students. The successful candidates will work in the fields of classical and quantum nanophotonics and chiral light-matter interactions. BridgETT is an application-oriented project with the goal of engineering a versatile platform using integrated optics in order to achieve efficient interfacing between nanoemitters and photons. This project will take place in one of the three French Technological Universities situated in Troyes, within the Laboratory for Nanotechnology, Instrumentation and Optics which is an associate CNRS lab as well as a member of the selected French National Laboratory of Excellence (Labex) called ‘ACTION’. Students will have opportunities to find jobs, contracts, PhD positions, permanent positions in industries and in research laboratories.